Tarps Plus Blog: Use Your Poly Tarps in Unexpected Ways! Poly Tarps can be used in so many other ways besides the usual construction purposes or for roof leaks. Poly Tarps really are something every house hold will for ever need. 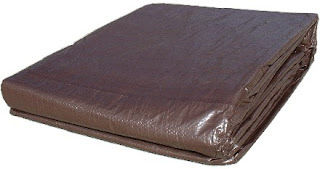 Poly Tarps are known for being great temporary covers, it can be a cover for your boat, power toys, wood, hay, toys, pools, really anything you want to keep out of weather a poly tarp will work just great. But what a lot of people don't think about is how great poly tarps can be to set up shade at a camp site or park, or a slip n slide, tent, or bottom protection for tents, for drive ways to keep leaks out of concrete, they are also very famous for those with a bit more of an imagination, such as temporary pool in backyard and there is really endless ways to use the poly tarp. Check out www.Tarpsplus.com and gets your today at a ultra low price. HA HA I actually used the poly tarp I bought off you guys in a pretty interesting way. I layed out the tarp and filled the back of the truck with water. We had so much fun just hanging out in the back it was truly memorable.